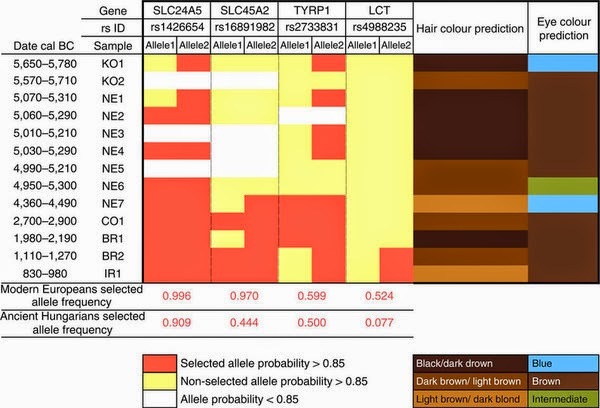 The oldest neolithic sample KO1 is a dark haired blue eyed man with I2a and "Armenian" mDNA R3. More La Brana-esque than La Brana. All of the male neoliths (4) have either Y haplogroup I2a or C6, generally considered to be pre-neolithic, which does not fit with male farmers from elsewhere taking local wives. The pre-Scythian Iron Age guy is Y haplogroup N with the distinctly far eastern G2a1 (also found in Lokomotiv, Irkutsk). Are we looking at a very cosmopolitan neolithic Hungary, or the population (possibly all male) that gave rise to the Finns? There should be some more Lengyel genomes out sometime before the end of the year. I think the mistake is in the comments, the Supplementary information clearly shows that IR1 is G2a1. This haplogroup nowadays is spread in Eastern Europe and Scandinavia, so could be older than recent Turkic intrusions. I also could not find haplogroup R3 in the latest Philo tree. According to the published mutations, it is now R1b1. It is shown R1b samples are from Yakutia, but for R1b1 ethnicity is not mentioned. Again for KO1 R3 sample, worked out R1b1 HM996895 sample is from Armenia. However a R haplogroup member of the Bulgarian DNA project N65113, who has the FGS test, has almost the same mutations as KO1. I don't know why she was not assigned to R1b1(old R3) as she has almost identical mutations to the Armenian as well. So I may conclude she is maybe from old Neolithic stock and not more recent Anatolian migration. "Grave 2638 (specimen IR1, a 4-6 years old child"
The Iron Age "guy" is almost a baby. Not many male troupes would take along a ~5 year old. I guess his G2a1 Mom can't have been too far away. So it was probably NOT an all male migration. (1) Distorted by widespread destructive funereal practices (incineration and air exposure, as per oral history). (2) A function of a sharp North/South diagonal divide. (eg Y-haplogroup G2a being a southern phenomenon). These folk were all burials. Two curiously with ochre on the skull (NE1, NE4). The authors speculate that this group of neolithic farmers had European Mesolithic paternal ancestry from a Sardinian-like population. "Interestingly, haplogroup I reaches very high frequency in Sardinians (40.7%), specifically the I2a1a sub-haplogroup, which is virtually absent elsewhere. 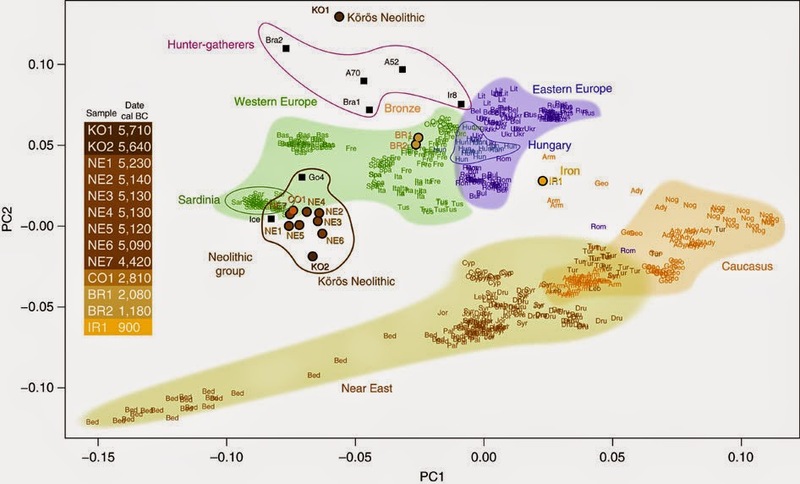 Haplogroup I was probably introduced there [Hungary] during the Neolithic by farmers with a Mesolithic paternal ancestry, "
This fits with Southern European Mesoliths (Mediterraneans?) acquiring farming and spreading it north into Hungary. The Connection of J2 with Indo-European expansions gets another point!. Perhaps G2a represents the Mesolithic Mediterraneans living in Sardinia (G2a AND I2a) whereas the Mesoliths moving into Hungary came from a precursor I2a population in, maybe Illyria, that had not picked up the G2a that Sardinia acquired. We new all along that Cristina Gamba's study would be groundbreaking - so here we are. The emerging evidence still seems to support a few basic themes about the origins of modern European populations. One is the expansion of an hunter gatherer population into the European interior from the Southeast at the end of the last ice age. It travelled by foot. That population was genetically adapted to the climate and environment of Europe. It is still the biggest source of the autosomal genes of modern Europeans. The second major source was a population that grew rapidly in size because of its adoption of agricultural technology. That population probably originated in the fertile crescent. But, the limited agricultural resources of that region forced it to quickly take advantage of the limited areas suitable for agriculture that were accessible by foot. The source of the part of that population that expanded into Europe appears to be largely at the Northern end of that region that is located at the Eastern end of the Black Sea. One likely reason is that the agriculturalists living there had already become more adapted to a colder climate through admixture with local hunter gatherer populations. Those populations could easily have included people with European genes. The expansion of these people into Europe was primarily by people who traveled by boat. Their boats took them along the Northern coasts of the Black and Mediterranean seas as well as up the major rivers that flowed into those seas. Both the Danube and the Rhone gave them access to the European interior. All modern European people seem to preserve some admixture of these people's genes. But, the proportion of their contribution seems largest around the European periphery in the South and the West. One likely reason is that those genes were more adapted to warmer climates. Another is that boats worked well for them in these areas and they were less impacted by the horse dominated cultures that dominated the next layer of the European interior. Iron Age Hungarian samples ending somewhere between Europe and the Caucasus. Another prove that the first to bring the "West Asian" like genes into Europe were the Indo_Europeans. I always argued that the early Indo Europeans would be something between modern Europeans and West Asians. Imagine a Lezgian+Russian mxied individual. There you have your proto Indo Europeans. "A new finding is that the Bronze Age individual BR2 belonged to haplogroup J2a1. I think this is the first time this has been found in ancient DNA and it falsifies the Phoenician sea-faring theory of the dispersal of this lineage. Another perfect prove that I was right and J2 first entered Europe with Indo Europeans. "A new finding is that the Bronze Age individual BR2 belonged to haplogroup J2a1. I think this is the first time this has been found in ancient DNA and it falsifies the Phoenician sea-faring theory of the dispersal of this lineage." It falsifies the Phoenicians as the sole means by which this lineage was dispersed, but doesn't rule out the possibility that they were still instrumental in its dispersal. Some time ago I used to speculate that either Lengyel or Baden or both were associated with a dramatic increase of the „West Asian“ component, and possibly the arrival of R1b or J2. For archeologically and craniometrically, a connection with Western Asia has been made by some experts. Now we see: Both Lengyel and Baden were no different from early European farmers. In fact quite to the contrary, in the PCA and in the ADMIXTURE analysis they are even slightly closer to Sardinians than the preceding cultures in Hungary, and the blue Druze centered component is slightly weaker. Also the y-haplogroup of the Lengyel male, I2a, is nothing new. The discontinuity between Baden, 2806 BC, and the early Bronze Age, 2082 BC, however does look dramatic! Judging from the PCA, the population changed in that short time from Sardinian-like to French-like, with an impressive increase of the North European component. Combined with picked up hints on the upcoming paper on Yamnaya I tend to think this must be ascribed to Yamnaya influence. In the late Bronze Age, 1181 BC, we then see for the first time a J2a individual. Autosomally he is very similar to the early Bronze Age female; the J2 people from Western Asia appear to have had little autosomal impact in this population. It's interesting though, that the J2a male does have a little bit of the blue Druze centered component, in contrast to the early Bronze Age female. In theory this might be a legacy of the local Neolithic cultures, but I think it's more likely that this came back together with J2a. Personally I think that this J2 influence may have brought the Lemnian-related Raetic language to central Europe. The timeframe, 1181 BC, and the geographic proximity to the eastern Alps, where Raetic has been attested, make this a serious possibility. I don't think the authors confused y- and mt-DNA in the case of the Iron Age male. Definitely it can't be a typo, because they write explicitly and repeatedly that the mt-DNA is G2a and the y-DNA N. So we have an East Eurasian connection there. And I wonder if the PCA and the ADMIXTURE analysis can really accurately assess the autosomal make-up of this individual, since there are no East Eurasian populations included in the analyses. Finally, on pigmentation: It's amazing! Apparently the early farmers gradually evolved towards a lighter pigmentation, while staying on the whole Sardinian-like. (That's a combination that nowadays no longer exists!) That's probably possible because not too many loci are involved in that change. This means that the later increase of the North European component can't be merely an environmental adaption. It has been claimed by some authors that the LBK farmers and related cultures were „Nordics“, or proto-Nordics. On the whole they are far from being similar to present-day North Europeans – but craniometrically there is some similarity, and now we know that even the pigmentation was at least partly similar. What makes this mtDNA “ultra-typical?” I don’t understand why this keeps being repeated? Clearly it was never the most common mtDNA found. In this study, it’s only reported for one culture group, out of 10 “neolithic” samples. Even Eva Fernández et al’s report of pre-pottery Near East mtDNA included H, but not N1a. Hardly “ultra-typical.” What obviously has been more typical is H, K and T2. The oddness of N1a justifies note, but not making it any kind of signature gene. This just becomes another bias in the reporting. Especially because it overlooks the consistent presence of H throughout the European Neolithic, which may be of much more importance of understanding what actually happened back then. The presence of y-dna I2a at Koros (@5,750 BC) should not be a surprise either. If you look at the ADMIXTURE plot from the article Dienekes posted above, you’ll see that the Koros specimen appears to be almost identical to modern Lithuanian, Russian and Belorussian populations. Andrew Sherratt once suggested that we abandon the word “migration” and start using the word “traffic,” because if you can go one way in a migration, it means you can probably always go back. What we may be seeing is a mathematically necessary fixation of some genes and therefore the disappearance of others in relatively small populations (by modern standards) that don’t signal migrations so much as gene change with the passage of time. Exciting to finally see J2a1 in Europe, even if one might have expected to see him there a little earlier. Also interesting that he seems to be West European-like (French?) according to the PC analysis in Figure 9 of the Supplementary material. I wish I knew more about the Kyjatice Culture. Still no R1b or R1a in this sample. Things are not looking good for the “it’s R as far as the eye can see” brigade. The idea that Indo-European is R1a or b should now be thrown on the junk heap of refuted ideas. But Dienekes, even though I don’t for a minute believe in the Phoenician dispersal theory I’m not sure how this find disproves it. It’s just one data point after all. "If all the female lines but U5 arrived in the Neolithic (IMO this is still not certain), then we are left with a scenario of a bunch of Neolithic WOMEN spreading farming to Europe!!! Dragging along their southern Mesolithic husbands that they picked up along the way." Interesting thought. An alternative might be captured farmer's wives teaching farming? I wonder if there were any examples of that happening on the US frontier? All the results are interesting ,and bring new pieces into the puzzle. For me, the iron age sample is the most fascinating. I am so exided if i think about what can happen in archeology in my lifetime! "If all the female lines but U5 arrived in the Neolithic (IMO this is still not certain), then we are left with a scenario of a bunch of Neolithic WOMEN spreading farming to Europe!!! Dragging along their southern Mesolithic husbands that they picked up along the way. :)"
Very interesting twist on what I have been saying earlier about neolithic y-DNA. But these would not have been individual women, they would have been farming family lines over multiple generations. So multiple captures, or a bunch of mobile but patrilical hunky hunter types attracting the attention of prosperous farmers daughters. I can imagine a scenario in which the husband hunted game for the family and the wife stayed home minding the animals, fields and children. In this case the women would have been the experts and it would have been their daughters would would have passed on the knowledge to the new family. What's striking is that BR2 has only 1.14% Gedrosia and 0% MDLP World-22 Indo-Iranian. Imho both components are associated with haplogroup R1b in Europe and in the Caucasus. At present Argyll has 13.1% Gedrosia, followed by other populations from the Isles and then Bretons, Dutch and Danes. And Norwegians have 3.8% MDLP Indo-Iranian, followed by Orcadians (3.7%) and the Welsh (3.4%). Apparently, R1b didn't leave a strong autosomal impact in the Carpathian Basin. It rather seems like the bulk of R1b people migrated to western Europe through Poland. A good candidate would be the Globular Amphora culture which preceded the Corded Ware by just a few centuries. That would explain why Gedrosia and MDLP Indo-Iranian are stronger in northern and northwestern Europe than on the Danube. It would also explain why the precursor of western European R1b, R1b-L11* (xP312, U106) is found in northern Poland, eastern Denmark, Switzerland and central England, but hardly in southeastern Europe. Imho R1b is also associated with strong ANE admixture. Look at the Scottish. In Europe, only Estonians and Hungarians have more ANE than the Scottish, and where if not from their R1b ancestors should they have got it from? Yet BR1 had only 12% ANE according to calculations on Eurogenes. The Scottish have 17.1%. Another piece of evidence against the theory that R1b expanded from the Carpathian Basin. Yet the story told by some went: R1b migrated to the Carpathian Basin with the Yamnaya culture and there split into an Italic branch that moved to Italy and a Celtic branch that moved to central and western Europe. Now either Italo-Celtic split somewhere else or it wasn't associated with R1b from the beginning, or both applies. By the way, in MDLP World-22 both NE7 and CO1 have 0% West_Asian. Gok2 from the Swedish TRB (one of the most hunter-gatherer admixed individuals from Gökhem) also has 0% West_Asian. Present-day Estonians have 0.7%, Sardinians have 0.8% and Basques have 0.2%. While all of the Indo-Europeans have at least more than 1% (and in many cases much more than that). NE7, CO1 and Gok2 are what Europeans were like before the ANE-rich eastern hunter-gatherer influence came in, together with R1a and R1b. But as the example of the Estonians shows, who have more ANE than any other European population, this ANE admixture didn't necessarily entail West_Asian admixture. That can be seen in the Basques as well; they only have modest ANE admixture, but it's still much stronger than their West_Asian admixture. It's still looking good for the theory of a West Asian origin of IEs. First the light skin, then the blue eyes and now the blond hair. None of it started in Ukraine with the Yamnayas. This is an important point to consider and should have been accepted as falsifiability criterion long ago. Only the fact it is not scientific prevents the rejection of the Pontic hypothesis for once and for all. I'm startled that some play the Kurganist card as happy as ever. E.g. the West Hunter blog: ' ‘Blond hair maps pretty well onto Corded Ware territory, which suggests that it came in with the Yamnaya.’ (Cochran in ‘Faster than Fisher’, 22-11-2014)?'. Hungarian NE7 has a match autosomal with kit F283231 a Pakistani dude on gedmatch.